If you are like most people, you have probably never heard of return of premium (ROP) term life insurance. According to LIMRA, an insurance industry research group, return of premium insurance only represents about 2% of term life sales, and at its peak in 2009 it only accounted for about 5% of sales. Despite its lack of popularity, it can be an excellent product, offering both term life coverage and a refund of all of your premiums should you outlive the policy. While this may seem like a “have your cake and eat it too” situation, there are a number of factors you need to consider before jumping into the ROP life insurance pool. Premiums can be high and you could earn a better return in the stock market, but ROP policies offer a full death benefit as well as the possibility of a cash windfall if you outlive the term. What Makes Return of Premium Term Insurance Different? In order to understand return of premium insurance or premium return life insurance, as it is also known, you need to know how term life insurance works. Term life insurance is probably the simplest and least expensive form of life insurance. It insures your life for a specific “term,” which can be 1, 10, 20, or 30 years. If you die during the term, a death benefit is paid out. If you don’t die during the term, the policy terminates at the end of the term. Term policies are a great choice if you are concerned about your family having to cover large debts (think mortgage payment or credit card bills) if you die unexpectedly. While everyone hopes to outlive a term policy, those that do often feel they have paid out a lot of money without seeing any benefit. A return of premium policy addresses those concerns. It is basically a term life policy with a rider attached that returns all of your premiums to you if you outlive the term. A major benefit of this type of policy is that the premium money returned to you is completely tax-free, as it is not considered income but simply a refund of premiums. While return of premium life insurance sounds like a no-brainer, there are a number of things to consider that might make it a less desirable option, especially if you are older. This policy pays out a death benefit, the same as a regular term policy, if you die during the term. A term policy allows you to choose the term that makes the most sense for your particular situation. Your premiums are returned to you if you outlive the term of the policy. The premium refund is tax-free money. Return of premium life insurance acts like an automated savings plan, forcing you to add to your savings every month. Some return of premium polices build a cash value that you can take loans out against. The loans have to be repaid or the refund or death benefit will be reduced by the borrowed amount. Premiums for an ROP policy are more expensive than a normal term policy; the price hike will vary depending on number of factors. Canceling the policy before the term expires will result in a much smaller refund or none at all. You may be able to make more money investing the price difference between a normal term policy and a return of premium policy. Policy details can vary between insurers, so read the details carefully. You don’t earn any interest on your money; only your premiums are returned to you. Will a Return of Premium Policy Work for You? While term life insurance is a very simple product, whether adding a return of premium rider makes financial sense can depend on a lot of different factors. Price: A return of premium rider will significantly increase your premium, especially if you are older. At a minimum, expect to pay 30% more for a return of premium policy when compared to a regular term policy if you are fairly young and in good health. If you are older, in your 40s or above, and in less-than-stellar health, the price difference can be double or even triple the cost of a normal term policy. Opportunity Cost: This basically means that you should calculate what you are giving up to go with an ROP policy instead of investing the money on your own. If you are a savvy investor and comfortable with risk, it may make more sense to buy the term policy and invest the difference that you would pay for return of premium life insurance on your own. You may also want to consider a permanent life insurance policy such as whole or universal life. These policies have a cash value component that grows over time and in some cases can be a better investment. Can You Afford the Policy? You will not get all of your premiums back if you don’t make all of the premium payments, so choosing a policy you can afford is important. If you let your policy lapse, you won’t be alone. According to LIMRA data, 1 in 14 term life insurance customers stops paying their premium each year. The situation is not much better with permanent policies. These policies have a cash value component, but even that doesn’t help retention. About 25% of policyholders lapse their policies in the first 3 years, and this number jumps to 40% after 10 years. If you let a return of premium policy lapse, you may get some of your premiums back. It depends on how long you have had the policy. While it can vary by insurance company, in most cases, if you cancel the policy in the first five years you will get back a big fat zero. The amount you get back then grows a small amount every year. In year 10 you might get back 10%, and it goes up from there. Buy/Sell Agreements: If you are involved in a buy/sell agreement with a business partner, return of premium term life insurance can be a great choice. A partnership buy/sell agreement basically states that you will buy your partner’s share if they die first and vice versa. An ROP policy will ensure that you have the funds available to buy out your partner. Return of premium policies also work well in divorce cases where one or both of the partners are required by the divorce decree to carry life insurance. A return of premium policy fulfills the life insurance obligation and returns the premiums if one or both of the partners live past the term. 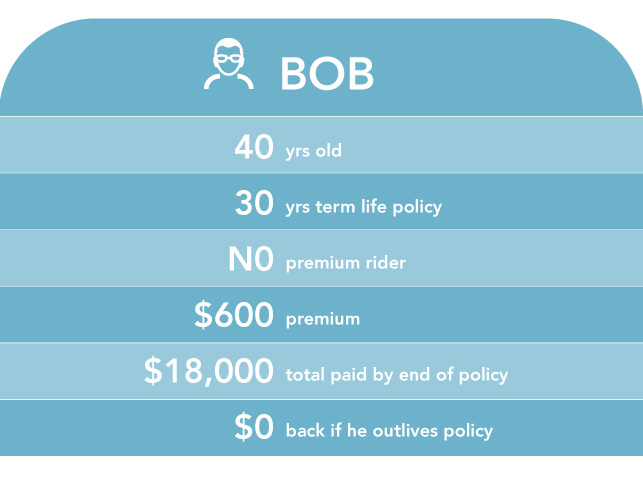 Let’s say Bob, who is 40 years old, buys a 30-year term life insurance policy without the return of premium rider. His premium is $600 a year. He ends up paying $18,000 over the course of the policy and gets zero back if he outlives his policy. 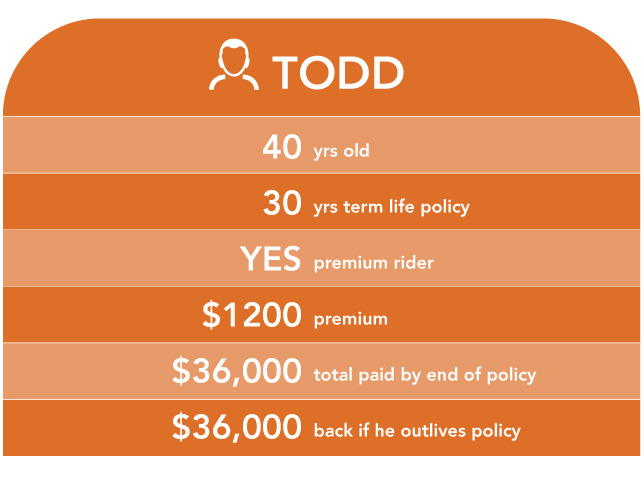 Bob’s good friend Todd (who is the same age) buys a 30-year term life policy and elects to go with the return of premium rider. His premium is twice as much at $1,200 a year, so over the course of the policy he forks out $36,000, but all of that money comes back to him if he outlives the policy. You need to decide whether recovering this money (assuming you outlive the policy) is worth the additional premium you will pay for that option. Can You Make More Investing the Difference? If Todd decides he wants to invest the additional $600 a year instead of paying for an ROP rider and puts the money in a Roth IRA that returns a very reasonable 7% a year, he will end up with $65,211 at the end of 30 years. This is a big increase over the ROP policy. This is assuming that Todd is comfortable investing in an IRA, his income is not too high to take advantage of a Roth IRA, and he has the discipline to invest the $600 every year instead of spending it. It also assumes that the IRA fund returns 7% a year, which is definitely not guaranteed. Anything less than an average 4% return will make the ROP a better option. While the numbers look good, it’s important to remember that returns in the stock market are never guaranteed, and the balance in your account can quickly tank during a downturn. In the end, you have to decide if higher returns are worth the risk and if you have the stomach for the ups and downs of investing. Return of premium life insurance can be a great way to make sure you have insurance in place for your family in the event the worst happens, and can also fund a nice windfall if you outlive the policy, but an ROP is not for everyone. When shopping for a term life insurance policy, it is important to take a detailed look at the numbers and consider all of the options available to you. A Trusted Choice agent can help you analyze your needs and determine if a term policy, a return of premium policy, or even a permanent life insurance policy is the best option for your situation. Get started now by contacting an agent.